Project Seeds: Spotlight: Vanvouver, Canada. Vancouver, the Greenest City in the World by 2020? Well, that's what the Mayor Gregor Robertson is planning on. Currently, 90% of the city's power supply is produced by hydroelectric energy, a source of energy that Vancouver is also leading the world in. Fossil fuels are also being reduced with investments in solar, wind, tidal and wave energy systems. The city plans to reduce it's greenhouse gas emissions by 20% lower that those reported in 1990, as per the Kyoto Protocol. Vancouver is also home to the largest living rooftop in Canada. The living roof, which covers the Vancouver Convention Centre's west building, currently covers six acres of space. It is also the home to 400,000 indigenous plants and grasses, which provides a habitat for butterflies, insects, birds and small mammals. The living rooftop also supports four beehives that house 60,000 bees. The honey collected from these hives are then used within the Centre's kitchen. In addition, the city has also seen the emergence of trash compactors, which are the equivalent size to a normal trashcan, but are able to hold five times the waste. This results in with less garbage trucks on the roads, as pick ups become less frequent to before. 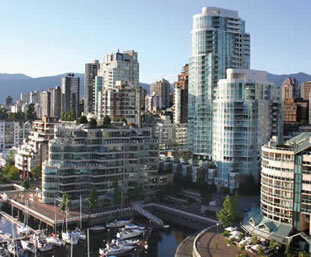 To learn more about Vancouver, the Green City, follow this link to the official government page.